Create your very own custom business card. Do something different. Try die-cut business card printing. 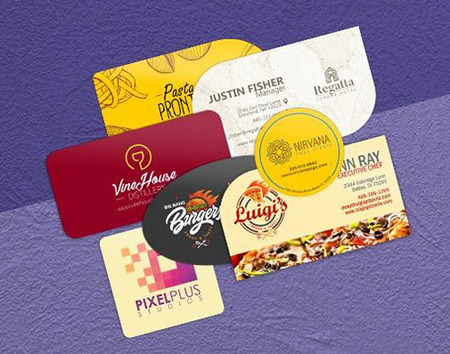 You can create different shaped business cards like circle, rounded corners, half circle, single rounded corner, leaf, or oval will be refreshing to your customer’s eyes who are used to seeing the same-old designs. And because your cards will be printed on thick 14 pt. cardstock, you can be sure that your cards will be anything but flimsy. We also offer coating options that make your cards even more special. Add a little shine with matte coating (or be a little more generous and pick gloss coating instead). For something that truly pops, our high gloss UV coating will give your cards the most shine. The coating also adds a layer of protections against dust and fingerprints. For more shapes, or to customize your own, call us and ask about a custom order. We have templates available for different die-cut business card sizes in different popular file formats. These should help you with design layout. If your usual business card designs just aren’t cutting it anymore, then it’s time to switch to die cut business cards. Using different shapes will give new life to your cards and make them unique enough to stand out from the competition. Since there are different shapes to choose from, you’re free to change up the design when you reorder so your cards are never the same. They will leave a lasting impression with whoever you give the cards out to. Die-cut business card printing works for businesses of any size — whether you’re a startup, a medium-sized enterprise, or a big corporation. What Are Die-Cut Business Cards?